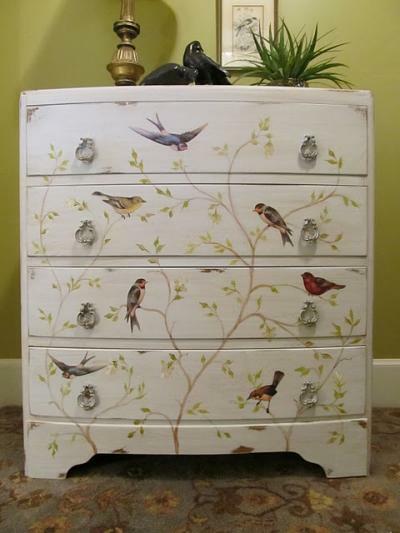 Painted and decoupaged chest of drawers by Lindy of Cottage Hill. First spotted on Tip Junkie. That is FABULOUS!! Think I'm gonna have to 'copy-cat'! Oh I love this! Thanks for the inspiration Kristi, I'm totally adding it to my "When I get more talent/time" file. Thanks so much for the feature and adding me (little ole me) to your blog roll! YES! love love love this….I have a chest of drawers down cellar crying for care. Gonna try this out. Noticed close up that there are flecks of color in the cloudy morning….How did you do that? omg! if only i'd needed something like this in my guest room! it looks fabulous!